Dave Blaney, the "Buckeye Bullet," plans to drive the No. 77 Ford. 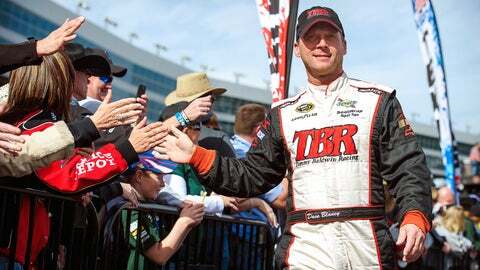 Dave Blaney will enjoy a reunion of sorts when he gets to Daytona International Speedway on Thursday for Preseason Thunder. "We dealt with each other at Front Row (Motorsports)," Blaney told FOX Sports. "I always liked him, but we never raced together before. "Obviously, it helps that we’ll have Doug Yates engines and picked up some really nice cars that Casey Mears drove before Germain switched to Chevys. So we’re off to. Good start." Blaney, 51, has 466 career Sprint Cup starts. His best Cup finish is third at Darlington (2003) and Talladega (2007, 2011). The Hartford, Ohio, native, affectionately known as the "Buckeye Bullet," won the 1995 World of Outlaws title and the 1984 USAC Silver Crown championship. His only NASCAR win came in the 2006 fall Charlotte Nationwide Series race. Lee Spencer is the Senior NASCAR Writer for FOXSports.com. She has provided award-winning coverage of auto racing over the last 15 years. Spencer has lent her expertise to both television and radio and is a regular contributor to SiriusXM Radio and the Performance Racing Network. Follow her on Twitter.